It’s taken me way too long to get around to posting about this, but I had the opportunity to meet Evered Kreimer, the famous astrophotographer who first used the cooled emulsion camera. 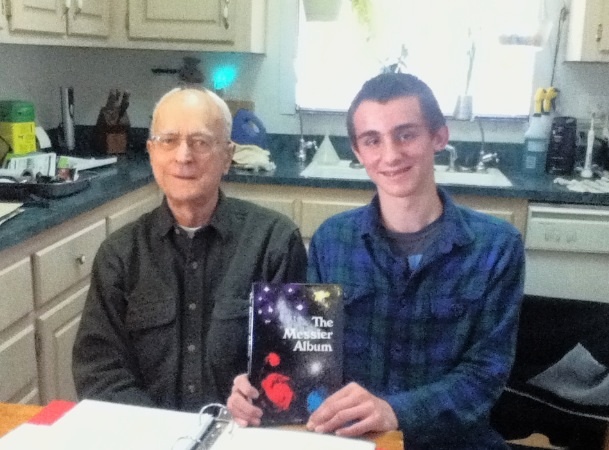 Evered Kreimer was a big name in amateur astronomy back in the 60’s and 70’s. He had a contract with Sky and Telescope magazine and had his photos included monthly. He became interested in astronomy when he was a teenager. He moved to Prescott, Arizona in 1962 and built his observatory, housing a Cave 12.5″ F/7 Newtonian. Later on he moved to another part of Prescott and built another observatory. He also had his own imaging processing room, to process and develop the Kodak Tri-X film that he used on his photographs. One of his biggest contribution was being co-author in the book, The Messier Album published in 1978. This book included information, sketches and photos off all the Messier objects as well as the history of Charles Messier. This is a popular book among astronomers looking for a quick reference on any Messier object. 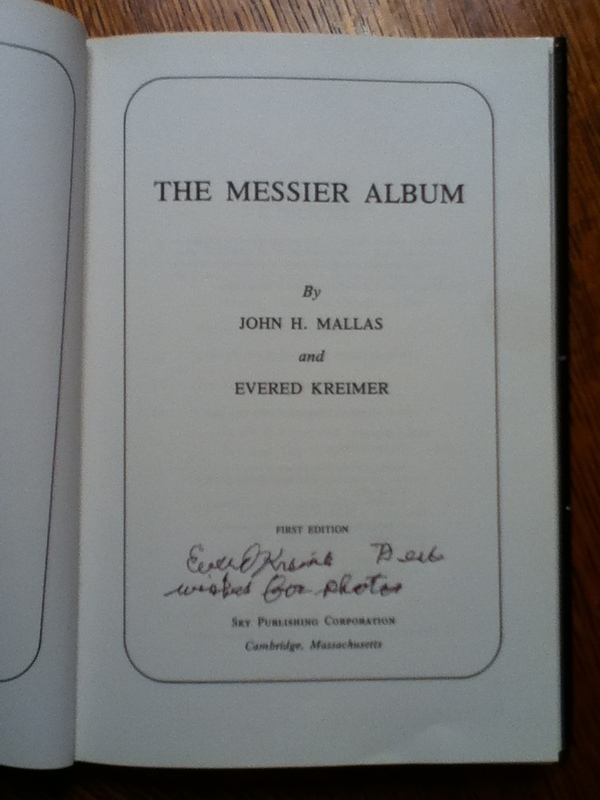 Kreimer included all the photos and John Mallas included the sketches of all the objects as seen through his 4″ Unitron Refractor. This book is still available today, look here. Anyway. no one has heard of him recently at all, not for the last several years. During a trip visiting my grandparents in Prescott (from 2/14), we managed to get ahold of him and he invited us down to visit him. Kreimer showed us his photos and told us his story. About 5 years ago, Kreimer gave away his telescope and sold his house, the observatory was torn down. He moved to a quiet, beautiful neighborhood in Prescott. He still is into photography, while he can’t get out under the stars anymore, he photographs birds, and has since switched to digital. He has a small spotting scope that he carries around now. Kreimer is still sharp as a tack, and he knows his stuff. He is 92. My grandpa and him really connected, he worked in a photo lab for over 30 years and did some astrophotography of his own with his 12.5″ F/6 Newtonian. They were both talking about how they did all the image processing, chemicals used, etc. Kreimer took a particular liking to my sketches, and it was fun comparing sketches with his photos. He told me that in the 36 years The Messier Album has been out, he never received one letter, one phone call, nothing. I’m the very first. This is the only signature in The Messier Album, and I’m so honored to have it be my copy. Thanks to all, who made this possible, my parents, my grandparents, and, of course, Mr. Kreimer.